Nepal and UAE will go into Wednesday’s ICC World Cricket League Championship in tomorrow’s clash needing a win for their confidence. Both teams have suffered shock defeats in recent times but will look to come good when it matters about the pride and prestige. Nepal and UAE will start off their 7th and last round of ICC WCCL 2015-17 on Wednesday’s (Dec-6). Recent times were the nightmare for both of the team. Either of the team didn’t perform according to their potential and standard. This two matches against each other will help one team to end up their nightmarish experience till recent times. Talking about Nepal cricket team, they had lost 7 matches out of 12 in this competition and placed in the 6th rank of the tournament. Their demotion to division two is already confirmed after a loss against Hong Kong. Out of their 4 wins in this competition, 2 came against Namibia in their home matches. Another win against Kenya came in the home matches itself. Only a win outside home came against Netherlands when they trashed the dutch by 19 runs on VRA cricket ground in 4th round of the tournament. They are far better team than what they have played so far. True that the wickets, the conditions, the environment are very different in outside matches. But they are paid professionals. They are into the big league. They have to adjust and acclimatize. They have highly paid professional coaching staff to mentor them, guide them. There cannot be any excuse that they would improve. Its high time that they need to stand up to their standard. Nepal is already out of the competition and is on the verge of being bottom most team. They have nothing to lose when they appear again tomorrow at Sheikh Zayed Cricket Stadium against UAE for the last round of ICC WCCL 2015-17. The trend of the tournament so far does not give enough confidence in anyone that the team would suddenly turn around and strike magic. Yet given the potential and past proven track record of team rhinos in recent time there are possibilities that Khadka’s inspired team may play for pride and salvage something out it. We still have faith that Nepalese team could win even tomorrow if only players realize their role and play as a team. But for that bowlers need to carry on their form and bowl consistently well in the right channel as they used to do in most of the matches, batsmen must play every ball according to merit and not panic, fielders must remain sharp and agile. Nepalese bowling has been exceptionally well throughout the tournament but matter of concern more for them will be all about their batting failure and inconsistency. It’s high time to have batting transformation in Nepal’s batting line up. They need to increase their batting depth, they need to have combination of youth and experience in their team now rather than sticking in with same players. As their junior players are showing great potential in U19 level, the team management need to provide them opportunity which will not only benefit the team now but will be beneficial for coming decade too. Although both of team failed to qualify for the ICC World Cup Qualifier 2018 through this tournament but still they have last cherry left on the cake. One among Nepal and UAE can qualify for the ICC World Cup Qualifier 2018 if they top the ICC WCL division II 2018. So they will have an eye for the perfect team combination for that tournament. Scenario are pretty same for UAE as Nepal. They also had a tough time recently. Their confidence must be at minimum level after they had been destroyed by the Afghanistan on the last round of ICC Intercontinental Cup 2015-17. They had just won 2 matches out of 7 in that Intercontinental Cup. They succeed to draw a match whereas they have lost 4 matches very badly. Scenario is nothing different in ICC WCCl 2015-17 for them. They are currently at the bottom of the points table with just 6 points on their bank. They had just won three matches in this tournament and lost 9 matches. They succeed to register one win against Namibia, Kenya and PNG. They will also be surely eyeing a win to end off a year on positive vibes. Tomorrow’s encounter will see a sellout crowd as its home game for UAE and thousand of Nepalese people have made UAE as their expatriate nation so they will surely not miss a chance to cheer their team. The weather forecast is also good -sunny with 77°F will be the average temperature of the day with only 1% probability of rain. Everyone wants to wear success, failures are indigestible . It is not the players alone the entire team management is responsible for the pitiable plight of the team out there. So both team players and management should be at their best to register a win tomorrow. Fingers cross to see which team will come out smiling tomorrow. 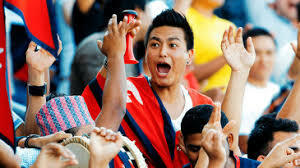 It is a matter of prestigeous match for Nepal. Must play good cricket in whole department to show the world its strength & capability..